“Teacher Friendly Bible Lessons on Short Notice” from Christian Faith Publishing author P.J. Mann is an easy to use instructional book designed to effectively allow an individual to teach a Bible lesson with little to no preparation. 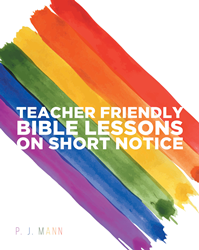 “Teacher Friendly Bible Lessons on Short Notice”: is an exceptionally well written instructional guide for Bible study classes. “Teacher Friendly Bible Lessons on Short Notice” is the creation of published author, P.J. Mann, a current chaplain for a local Good Samaritan Society care center. Mann continues to lead weekly Bible study classes for women in the county jail, as well as, in a local retirement home. Mann holds a Bachelor of Arts degree, majoring in English, with a minor in Speech. Published by Christian Faith Publishing, P. J. Mann’s new book allows the reader to teach and guide young minds on a spiritual journey through the Bible. These fifty-two easy to follow lesson plans are prepared in such a way that there is little need to prepare. One must simply open the pages, select a lesson, and enrich the minds of others young and old. View a synopsis of “Teacher Friendly Bible Lessons on Short Notice” on YouTube. Consumers can purchase “Teacher Friendly Bible Lessons on Short Notice” at traditional brick & mortar bookstores, or online at Amazon.com, Apple iTunes store, or Barnes and Noble. For additional information or inquiries about “Teacher Friendly Bible Lessons on Short Notice”, contact the Christian Faith Publishing media department at 866-554-0919.